PAF Public School Sargodha completed its 50 years in 2003. To commemorate this landmark achievement a monument was erected at the School. The site selected was exactly where the millinium court of basketball used to be: adjacent to the Canteen. The Civil Works Organization (CWO) under the able guidance of Lieutenant General Khalid Ahmed Kidwai (615-S) and Begum Lubna Kidwai completed the project. Inauguration ceremony of the monument was made part of the Golden Jubilee Celebrations held from 11 to 13 October, 2003. 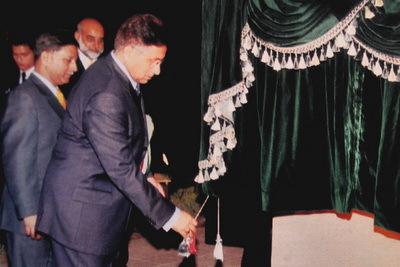 On 11 October 2003, the President of Pakistan, General Pervez Musharaf unveiled the inauguration plaque. The School Head Boy, Mohsin Javed, recited few verses from Holy Quran and offered Dua on the occassion. The Golden Jubilee Monument is a superb piece of architecture erected in an exotic landscape. Inspiration of the monument comes from the Quranic Verse (Surah Ar-Rum : Verse 30)urging man to mould himself in the nature of Allah. The verse set in Thatta stone against the fountain wall gives a deeper meaning to the School's motto "Aim High". 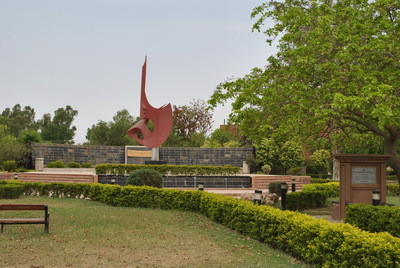 The central art piece designed by world renowned sculptor, Anjum Ayaz, symbolizes the School's motto with a pen (Qalam) and a bird in flight. The central space is an octagon depicting the eight Houses of the School.